Mass is the amount of matter an object has. We often use a triple-balance beam to measure mass. A triple-beam balance gets its name because it has three beams that allow you to move known masses along the beam. 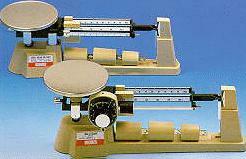 Here is a picture of a triple beam balance. You probably have used one in school. There are also many other types of balances. Scientists need balances that can measure very small amounts of mass. If you are interested at looking at the many other types of balances click here. Because a triple beam balance compares a known mass to an unknown mass it is unaffected by gravity. 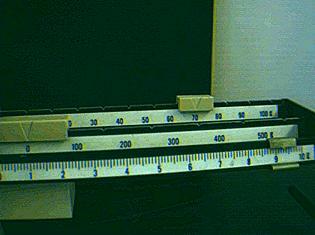 Unlike a spring scale which really measures weight, the triple beam balance gives a true measure of mass. Now it's time to practice your skills using the triple-beam balance. A block is put onto a triple beam balance. What is the mass of the object (to the closest tenth of a gram? Click on the picture below and get a closer look at reading the scale after the scale has been balanced. Remember to find the mass using a triple beam balance you must add the mass values of each of the three beams. Type your answer in the space provided below, then hit the submit button. If you need a calculator one is available. Click on calculator button on the right side. Having trouble? Try this hint. A block having the same dimensions is now put on the scale. What is the mass of this object? Please continue to the next chapter on volume.